This is a very smartly priced mug, insulated for cold or hot beverages. It is lightweight, durable, and has served us well for canoe camping and car camping trips. It also would be good for backpacking or day hiking excursions. This is a great mug for our camping purposes. We do not usually backpack, but since we canoe camp, we do appreciate how light this mug is. It only weighs 3.2 0z. It also comes in a variety of colors. 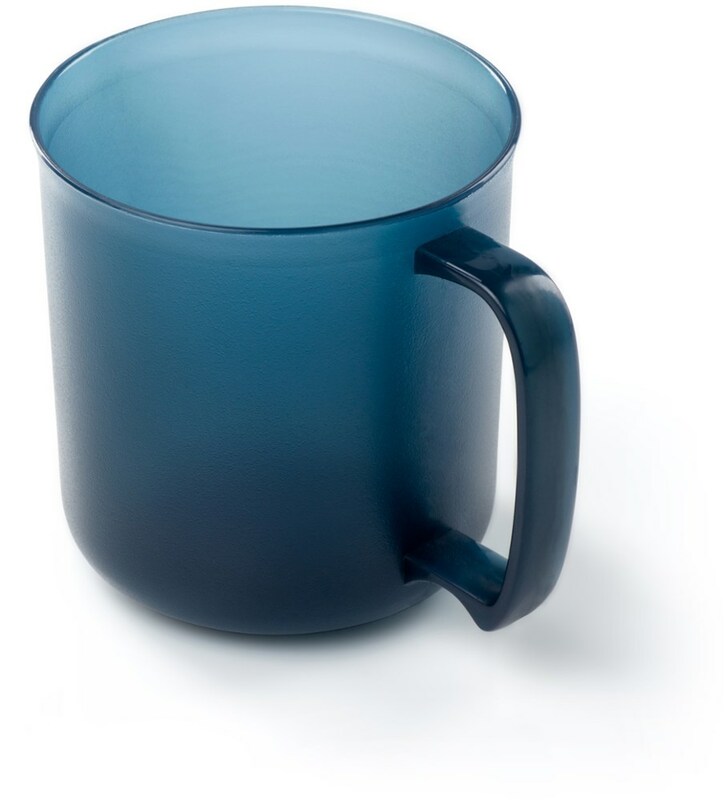 The mug is strong, made of BPA-free polypropylene, and is dishwasher safe. It is not microwave safe. 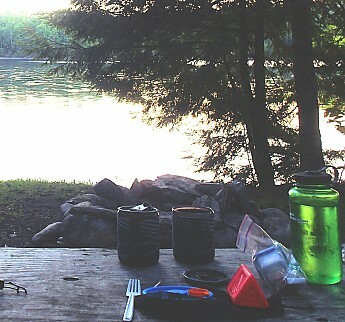 However, that is not a big issue, as we rarely have access to a microwave when canoe camping! 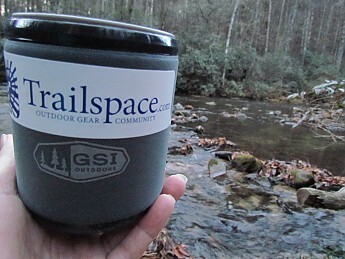 We now have two of these mugs, and they are with us on every canoe camping outing. The mug has a soft, insulated outer layer, which makes it easy to grab, even when it is full of very hot liquid. It has a nice integrated webbing handle, which may be a bit snug when wearing gloves, but does allow you to hold the cup and drink while using the handle. The diameter of the mug is such that is stays stable on even uneven surfaces, and is also wide enough that it can be used as a small bowl, for oatmeal, etc. 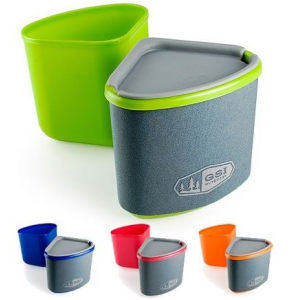 The lid snaps on and off easily, yet stays securely on the cup. There is a small “sippy opening” in the lid. The mug keeps both cold and hot beverages at the desired temperature much longer than other mugs we have used (anecdotally). The capacity is 17 oz. So even though the mug does not look that big, it has a nice capacity. The mug has cleaned up easily, after use for hot chocolate, hot cider, and milk based drinks. I think the mug is very reasonably priced, at $9.95 msrp. Should we lose one, or it becomes damaged, we would replace it, as at that price, it is not a large investment. We definitely recommend this mug. 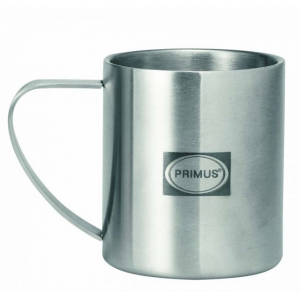 Lightweight insulated mug that edges out the competition on all the finer points. This mug has been amply and ably reviewed in its various versions by other TSers, but I thought I'd put in my .02 with the addition of some SCIENCE! 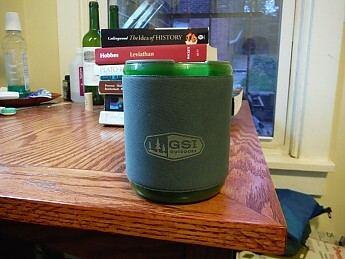 When my well-used old Sea to Summit mug developed a tear in the outer insulating layer, I picked up the GSI version at a local outdoor store. Since my wife's S2S mug was still intact, I decided to do a head-to-head comparison of these two very similar products. 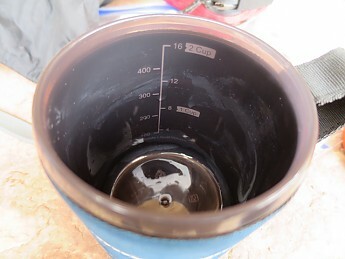 The GSI mug is 20 g (0.7 oz) lighter, has approximately 40 ml greater volume, will hold liquids hot somewhat longer than the competition, and costs less. Plus, if you really wanted to save weight, you could leave the insulation behind and save almost a full ounce! To test the insulating ability of the mugs, I boiled some water, quickly filled both mugs (GSI first), and put the lids on, with the sip hole open on the GSI mug. 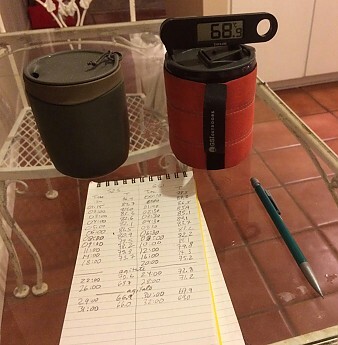 I inserted a kitchen thermometer through the sip hole, with the probe at an angle so that it was away from the wall of the mug, and alternated measurements between the two mugs at intervals ranging from 30 seconds at the start to 4 minutes later in the test. I recorded time and temperature and ran the test for about 30 minutes. I agitated both mugs after 20 minutes and again after 28 minutes. 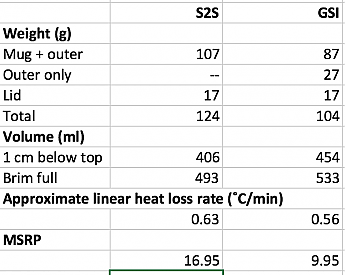 At the start of measurement, the S2S mug was already about 2˚C cooler than the GSI mug, but I'm not sure that this wasn't a result of the order in which they were filled, and I have not replicated the experiment to test for that. But as the equations on the graph show, the line fit to the S2S data is slightly steeper than that for the GSI data, indicating a slightly more rapid cooling rate. 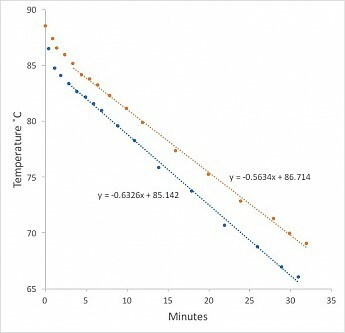 These lines were fit to the data after the initial rapid cool down, where the cooling rate became approximately linear. So that should resolve the volumetric issues discussed below, at least for folks who haven't bought one already. Wow, that's a lot of detail. Thanks for the science, Big Red! My wife purchased on of these recently and has really liked it. She might have a problem with the limited data in the sciencey part of your review though, but that is what she does :) Maybe run that test fifty more times? Just kidding. Nice review Red. Great review. I switched from a S2S mug to this one as well. My only complaint is the lack of measurements for cooking. Easily fixed with a sharpie or engrave with a knife. One option I like is removing it from the outer insulation and enjoying my after dinner scotch...feels like a whisky glass (not quite but close enough). Good idea with the sharpie, Phil, I may have to try that. 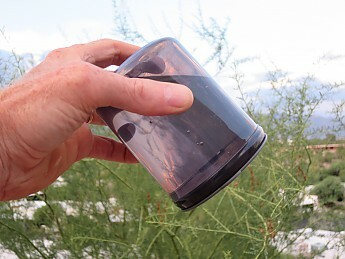 You could take the mug out of the liner and mark it on the outside, and also use it without the liner so you could see the marks when measuring. Great review. Last weekend, while my coffee was getting cold, I said to my wife that we really should find something with better insulation. I think you sold me! The mug my wife recently bought has measuring marks on the inside. Not real easy to see the numbers without my glasses, but if she pointed to a mark I could hit it. Not sure if she has a new model or ? The sharpie works but does wear off after a while...over a year of use for me. I am considering engraving it but don't want to damage the cup part. Just saw your comment LS. Checked my mug and it doesn't have markings...even put on my reading glasses but nothing besides my fading sharpie. Great review, BigRed! Thanks for the science! I bought 2 of these for my girlfriend & I for backpacking when this version came out because of the spill proof opening. We've absolutely loved them and they've become essential gear for us. After you mark it, put a piece of Scotch tape over the mark. It will greatly increase the wear time with little added weight. I use scotch tape on my credit cards so the little number on the back doesn't wear off for online purchases. Holds up great. 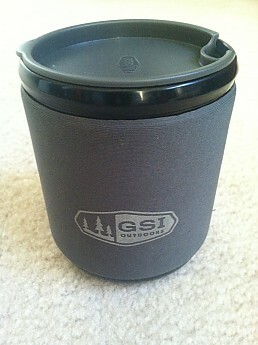 The GSI Infinity Insulated Mug is my go-to backpacking cup. 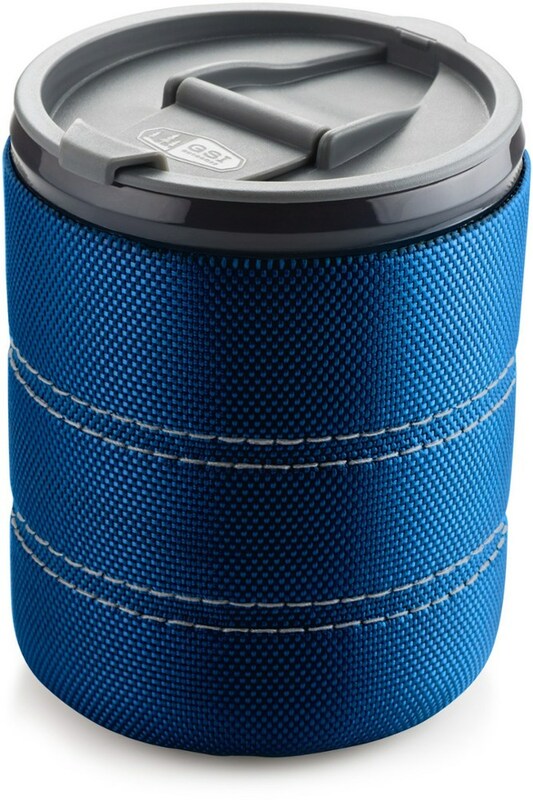 It is lightweight, sturdy, insulated, and has a lid. I use it for hot chocolate, backcountry cocktails, and Propel water mixes. The GSI Infinity mug is a 3.2 ounce cup that holds 17ounces of liquid. It has an insulated coozie on the outside of it that both insulates the liquid and keeps your hand from getting hot or cold. It is made from BPA-free polypropylene. It does not absorb odors or colors and it is dishwasher safe. 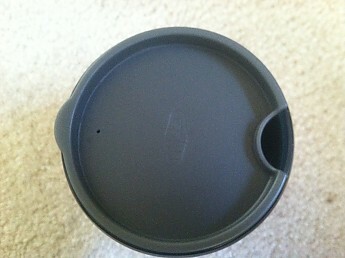 Another nice feature of the Infinity mug is that it has a Sip it lid that has a small opening on the side of the lid. I found the size of the opening and its location to be convenient. It helps further insulate your beverage and serves as a splash guard. 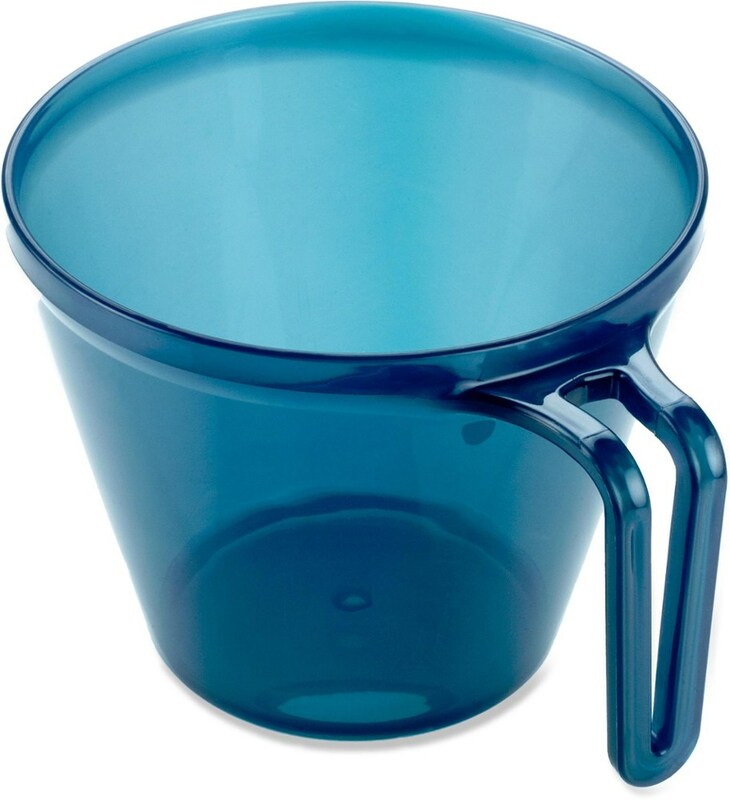 The only thing that I do not like about the cup is that the lid is difficult to remove. I have had this mug for about two years now and it has been used on every trip I've been on since it was purchased. It is very durable and sturdy. I still can not justify a need for any other mug. This one has met all of my needs. 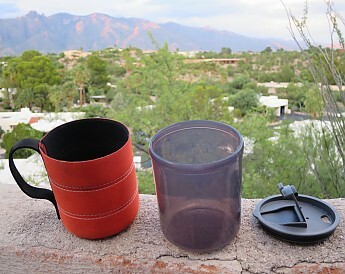 Overall: If you are looking for a lightweight, functional, inexpensive backcountry mug, this is a great choice. I've got a couple of these, and they are perfect to take along. Hardly know it's there. This is a great coffee mug. Picked this up about three months ago and it's held up well on several overnight and multi-day trips. It's stable while on the ground, it doesn't have hard edges or angles making for easy packing, it insulates well, and the webbing handle can be used to drink in a couple of different ways. Overall a great, inexpensive mug that does what a mug should! Thanks for the review and pictures, Andy. 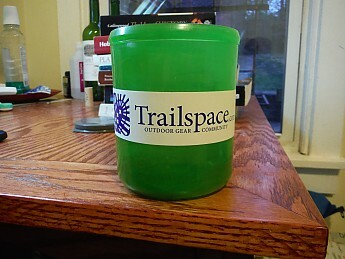 Best darn backpacking mug I have ever used. In the 1960s, I used the stainless steel Boy Scout cup which burned my lip on the first sip and yielded cold coffee on the second sip. In the late 1970s Aladdin came out with a 12oz insulated mug that was very cheap but worked nicely. I used these until about 2011 or 2012 when I discovered the GSI cup. What an awesome product at a reasonable price! 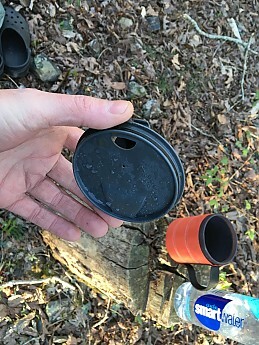 Coffee and soup stay hot, it is easily cleaned and, instead of taking a measuring cup, I took out the Lexan insert and scratched measurements on it at 1/2 cup levels so we could hydrate our backpacking meals. It would be nice if it came in more colors, since all of my hiking friends (and anyone else who sees it) now has one and the few colors available can lead to confusion. Thanks for the review of your mug, Rod! Thanks for adding to the conversation, Rod. I remember my own SS Boy Scout mug. Reasonably light mug that works well as a cup or even a small bowl. 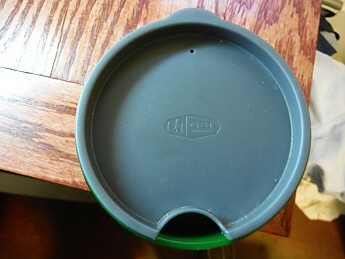 I own the older version of this mug which had a removable lid and an insulated sleeve, but no handle and no cover over the opening in the removable lid. 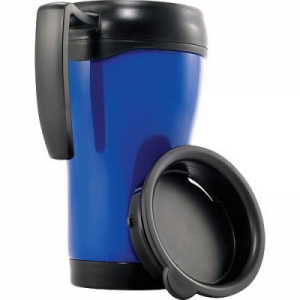 This mug is pretty simple, but the sleeve and the detachable lid are nice features that really help to keep heated beverages and food warm while keeping your hands from getting burnt. Additionally, the sleeve is made of neoprene-like fabric that dries quickly if it gets wet. This is a wide mug that has the same diameter throughout that makes it ideal to use as a small bowl that is easy to get a spoon or a fork into. If used as a small bowl, it will probably not hold your entire meal in it at once. 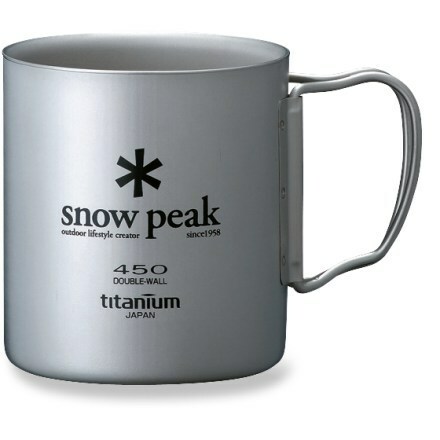 I really like this mug because it nests perfectly inside my Snow Peak Titanium Mini Solo Cookset. Additionally, the Infinity mug is large enough to hold my Coleman Isobutane-propane backpacking stove (without the fuel canister). I have also tried nesting the MSR PocketRocket inside this mug and it fits as well. This mug is very durable—there really aren't any moving parts that you can break on it. The lid can be difficult to remove at first, but after some use it comes off with ease. Given its relatively light weight, it is good for backpacking. I also like to use this mug at home when I want a large amount of tea or coffee; however, it is not microwave safe so it is not as convenient when you want to heat something quickly. Thanks for sharing this helpful review, Andy. Nice stickers! I've been wanting/needing a new backpacking mug because when I bring my girlfriend with me I can't drink coffee out of my Jetboil anymore. 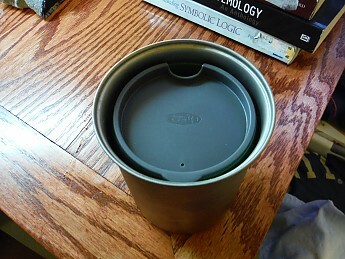 Up until they improved this mug I couldn't find a lightweight insulated mug with a licking lid. I've spilled my coffee plenty of times to know I'm clumsy and this is perfect. It's so light you won't notice it and it's in a cozy so it stays warm a long time. So now you can make soup, tea, or coffee and not spill and it will stay hot until it's in your belly. Lightweight, keeps drinks hot, fun to use. I ordered this item from Amazon, thinking I was getting the Infinity mug that had no handle. Imagine my surprise and delight when I got this model! Not only was it better-looking, it had a webbing handle! This mug is my new favorite (my previous being an old North Face insulated mug that I got at a product seminar when I worked for an outdoor retailer in the early '90s). It's light, the insulation is fantastic, and it looks just the right amount of outdoor stylish. The lid fits tight (another reviewer thought this was not a good thing, but with a full load of hot beverage, believe me—you want that lid tight!). My only complaint was that the lid over the mouth hole did not shut tight, so if you knock the mug over, it would probably spill. I love the fact that the mug does not retain odors, which makes it nice to switch between tea and coffee with no residual taste. That's because it's made of non-leaching, clear polypropolene that is also 100% recyclable. The mug has an insulated sleeve that works very well; I've had a steaming mug of coffee for a long time after pouring. It also has a collapsable webbing handle, which is a very nice touch. The 3.5 oz. weight of the mug holds a generous 17 oz. of liquid. Well done, GSI, well done! Keeps coffee hot, though you can feel the heat through the insulation and colored cover and the cloth handle is not stable. Cloth handle is not sturdy. I found the coffee drips down and stains the colored cover. Repeat of pros and cons where it keeps my coffee hotter than an insulated, unlidded coffee cup, but I don't like the cloth handle or the stain on the cover from dripping coffee while sipping. Thanks for the review, John. Too bad about the staining. 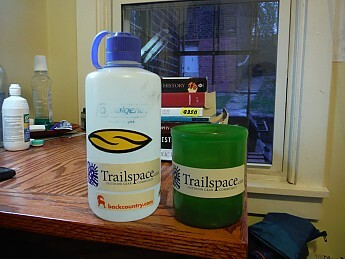 I'm reviewing the updated model (the one pictured by Trailspace, mine is in the sink...or in the car. I don't know). The insulating quality is okay, nothing special, nothing inadequate. I do like the handle on it however and can fill up my mug, hike with a full cup of hot coffee or throw it on my floorboard of the car and not spill a drop. I actually bought another for a friend of mine who climbs professionally in the cold and loved it, he tried stealing mine. However...there is a terrible aftertaste that never dissipates. In mine it is dish soap. Better than some other things I can think of. Still when I want to use it on road trips as a recycler mug at Starbucks or something and in the woods for my espresso...it's less than stellar to have an underlying hint of Dawn lol. I actually rarely take it out on hikes anymore. The weight is ridiculous for just a mug. I'll take it on day trips or short weekends, road trips, etc. Usually it's in my cupboard for a to-go cup. Thanks for the review, Ashley! Do you have any pictures of your mug you'd be willing to share in your review? Great bit of kit, I own at least three. I'm a Scouter. Great bit of kit, I own at least three. I'm a Scouter. I have seen them all over the years. I have every mug made I think, and I just couldn't settle till I found this one. 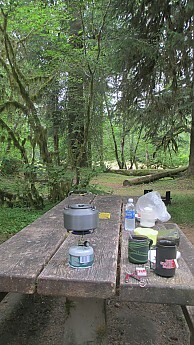 For canoeing for years I used an MSR Ugamug. The one feature I like about this mug is if you throw a folding titanium spork and small salt and pepper shaker inside it and close the lid, it will fit inside a Fairshare Mug. Great feature. Compact full mess kit. Thanks for sharing your first review, Nnelg. Overall it's not a bad mug, it's just not perfect. 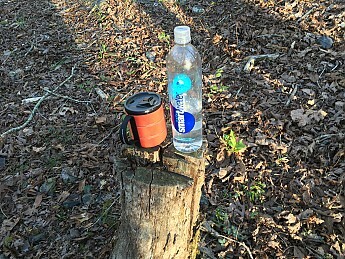 Was purchased as a lightweight mug for day-hiking and backpacking use for a coffee addict. Pros: lightweight, lid fits securely but isn't impossible to get on and off, outer insulated sleeve slides off/on easily, size of the mug isn't too big around for my stubby fingers, volume it holds is perfect, relatively easy to clean plastic mug and lid (haven't washed sleeve). Cons: handle is too big/floppy to safely use as a true mug handle, you always have to slurp coffee off of the portion of the flip down lid that actually seats into the hole or it will drip on your nose when you tip the cup to drink, actual lip of mug could be a bit taller — I envision the edge of the neoprene sleeve getting gross in time. 3 out of 5 stars in my opinion.